The world has become a dangerous place, and we want to keep our first responders and civilians safe in all situations. That's why we made this Level 4 version of BlueStone Safety Product's Grab and Go body armor vest. The Level 4 Tactical Grab and Go bullet resistant vest is proudly made in the USA and is proven to stop rifle rounds, handgun rounds, and armor piercing ammunition including .308, .762 x 39, .556, .223, and .30-06! Our bullet resistant vest can be hung up at the station, in your firetruck, or in the trunk of your car so you can throw it on if a dangerous situation arises. There is a pocket on the front and the back that hold BlueStone Safety Level 4 10"" x 12"" Plates perfectly in place to protect your vitals. The Tactical Grab and Go has molle included on the vest to allow magazine pouches, handcuff pouches, and other tactical additions. 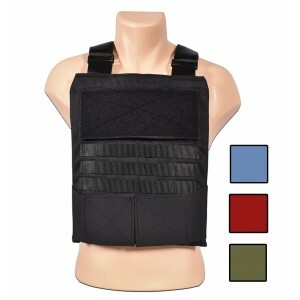 The shoulder straps are extremely comfortable and all the straps are adjustable to make this a one size fits all vest. Also, the Velcro on the front and back gives you plenty of space to put Police/ EMS/ Fire Dept patches on the vest if you're a First Responder. If your department is interested in patches, feel free to contact us. Proudly made in the U.S.A. and backed by our 5 year warranty for craftsmanship! !